Vision Hospitality Group wants to put guests back at the center of the hotel industry again with the launch of their newest division, known as "Humanist." Vision Hospitality's new division will focus on boutique and lifestyle hotels with the launch of their first, own national brand "Kinley," company officials said. The new brand and division puts an emphasis on the community surrounding the hotel instead of the amenities inside of it, said Ashley Ewing Parrott, Vision Hospitality's director of brand strategy for boutique and lifestyle hotels. "Kinley approaches tourism and hospitality with a little different focus," Ewing Parrott said. "We are just that comfortable place to rest your head, get your cup of coffee in the morning or cocktail before bed, and we really want to thrust you into the community and highlight the neighborhood." Vision Hospitality sees their new Kinley hotels as being the "living room" of a neighborhood. Derived from the word "kinship," according to their website, the hotel will be a home base for the "active explorers" and "casual adventurers." Vision Hospitality has 36 hotels nationwide with around 15 in development now and seven under construction. The company has historically operated hotels under the Marriott and Hilton franchises. "Vision Hospitality Group is an industry expert in that type of product," Ewing Parrott said. "I think the main reason we wanted to do (Humanist) is because we see an opportunity to gain experience and knowledge and expertise in this segment. We've mastered one, and we want to continue to learn and evolve as a hotel company." Instead of providing dry cleaning, a spa or other hotel amenities that drive up cost for the guest, the Kinley brand will focus on attracting travelers who want to get out and experience the city and might not want the added cost of those extra frills. Instead of limiting themselves to a certain demographic, Ewing Parrott said it's more about the mindset of a traveler. The brand does draw some of its inspiration from home-sharing companies, like Airbnb, but Ewing Parrott says they don't see a direct competitor yet. "More and more people are looking for unique accommodations and to immerse themselves in that local experience," she said. Vision Hospitality President and CEO Mitch Patel says the company is thinking "longterm" with the Kinley brand, hoping to develop and grow it nationwide. Vision Hospitality declined to quote a specific price point for a room at a Kinley hotel but said it will be a "moderate price point." "Hotels have been quite a bit behind because it's so capital intensive," Patel said. "There aren't a whole lot of hotels like these in Chattanooga or Cincinnati but plenty of them in New York City, Los Angeles and Chicago." 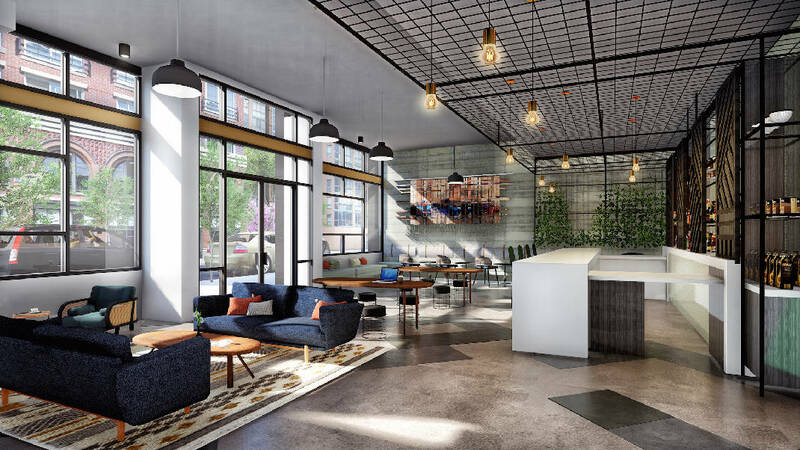 Currently, Vision Hospitality has only announced two Kinley hotels — one in Chattanooga's Southside neighborhood and the other in downtown Cincinnati. In the Southside, the four-level, 64-room property will go up on what's now a parking lot across Market Street from the Chattanooga Choo Choo. The multimillion dollar project should be open by summer 2020, Patel said. Amy Donahue, director of marketing and communications for the nonprofit downtown redevelopment group River City Co. told the Times Free Press in December that the Southside has more Airbnb rentals than any other part of downtown south of the Tennessee River. While food and beverage sales have historically not been a big focus for Vision Hospitality, the company has put a greater focus on that element of the hotel experience recently, especially with their new upscale boutique hotel off the Walnut Street Bridge in Chattanooga, the Edwin Hotel. The Edwin features the Whitebird restaurant on the first floor and the Whiskey Thief rooftop bar. In the Southside, the new Kinley hotel will also include a speakeasy-style bar. Ewing Parrott said the hotel group felt there were already several restaurants in the Southside area guests would be interested in trying, so they wanted to bring a concept to the neighborhood they felt was missing. Called "Company," the new speakeasy will be intimate — with seating for just around 35 guests — and is a play on the popular phrase to eat and drink "in good Company." In Cincinnati, Patel described the area around the Kinley as a food desert with few lunch spots, so they will have a full-service restaurant open for three meals a day and operated by celebrity chef Ed Lee. According to Patel, each Kinley will have a unique food and beverage component based on what the neighborhood needs. While the Edwin — a Marriott hotel — is considered to be more upscale than the Kinley brand, it will still be included in the Humanist portfolio. So will the Grady Hotel, a 51-room boutique hotel that Vision is constructing in downtown Louisville, Kentucky. The new Humanist division is now on the second floor of the hospitality company's downtown building off Broad Street, and it was renovated and designed to be a comfortable working space that draws people out of their offices and collaborating with one another. Patel said the division could add around 25 people as their new brand grows nationwide. The roughly 6,000 square foot space on the second floor includes six offices, an industrial kitchen, break room and second kitchen, co-working desks in the middle of the floor for regional or traveling employees, a model hotel room and more. There is a traditional conference room but also a more non-traditional "huddle room" with a couch, TV and other comfortable seating. Vision Hospitality owns their building at 411 Broad Street and moved into the third and fourth floors in 2014. There are approximately 35 employees in the corporate office with five employees in the Humanist division right now. Patel and Ewing Parrott said they think the new space on the second floor will help attract and retain employees with the kind of people-centered thinking they are looking for in the new brand. "We feel like this whole boutique and lifestyle hotel space is different," Patel said. "It's so different that we wanted people to think differently from the beginning, and it requires a different mindset of people who we are bringing onboard."